Then, out of the corner of her eye she spotted a frisbee. Gingerly, she walked over to the Frisbee, all the time keeping her eye on the bush. She picked it up carefully and walked nervously back to the reassuring presence of Anil. Next, with more confidence she aimed the Frisbee at the bush. The snake shot out as if it had been hit by a bullet. Anil started banging his stick on the ground and uttering blood-curdling yells. 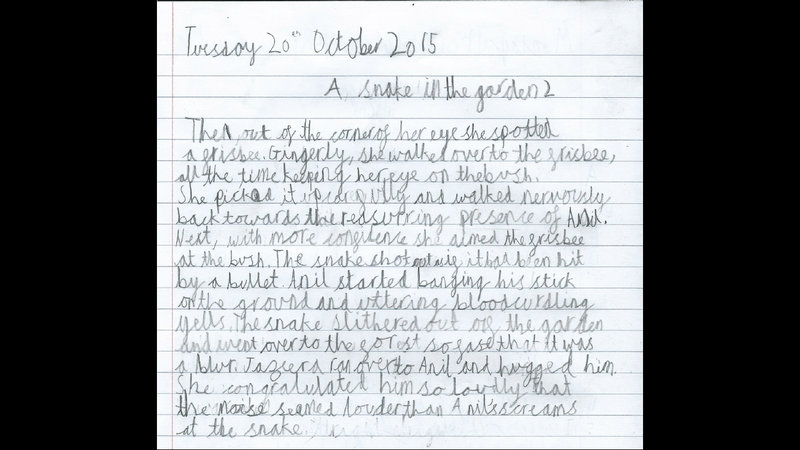 The snake slithered out of the garden and went over to the forest so fast that it was a blur. Jazeera ran over to Anil and hugged him. She congratulated him so loudly that the noise seemed louder than Anil’s screams at the snake.